This Slow Cooker Lemon Rosemary Lentil Soup is one of the easiest soups to ever come out of your kitchen. Fresh vegetables, lemon and rosemary become an amazingly hearty soup with minimal effort. Original content posted January 2015. Updated January 2019. If you would’ve ever told me I’d be serving this Slow Cooker Lemon Rosemary Lentil Soup for dinner and my family would be convinced that lentils were not only delicious, but also an acceptable protein substitute, I likely would’ve laughed. In your face. My dear husband is as textbook meat and potatoes as you can get. And then there is the menagerie, who will at times decide they don’t want to partake in whatever I’m serving for no particular reason. For the record, if you don’t want to eat what I’m serving, I’m totally fine after you take your obligatory bite. Then about a year ago, I introduced our family to Slow Cooker Lentil and Brown Rice Tacos and I can’t remember the last time I served tacos with ground beef. Miraculous! 2014 will forever be known as the year of the lentils! So as I dreaming up new recipe ideas, I knew I wanted to combine our new love of lentils with my undying devotion for my slow cooker. 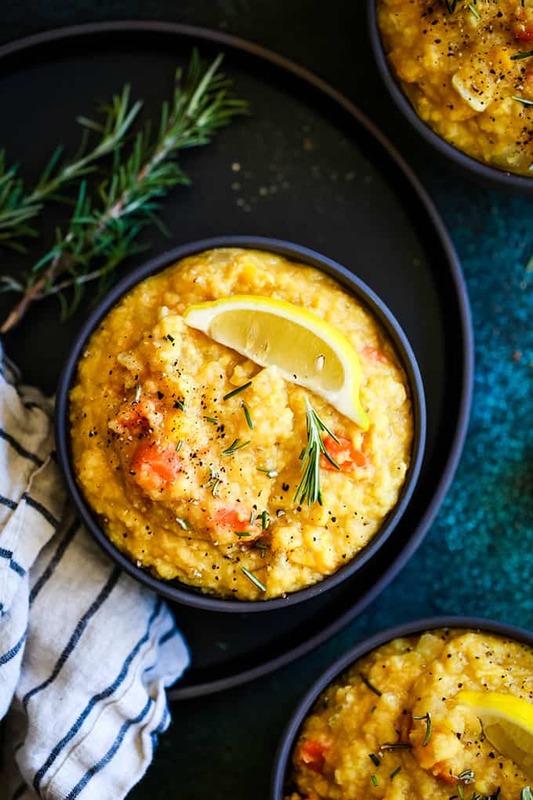 I’m so thrilled with the end result, this Slow Cooker Lemon Rosemary Lentil Soup, and have no doubt that you will be too! TIP: For those of you that insist on some type of meat in your meal, I have no doubt you’ll love my Slow Cooker Sausage Lentil and Arugula Soup. Fresh vegetables, lemon and rosemary become an amazingly hearty soup with minimal effort. 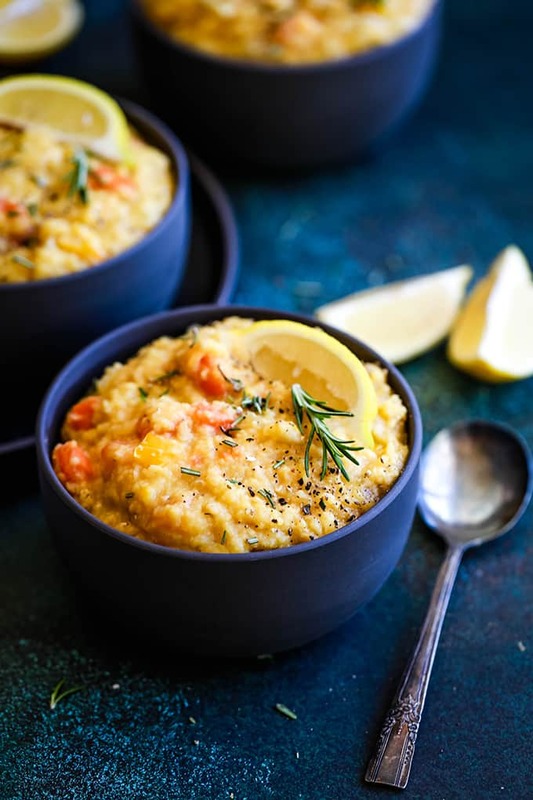 Carrots, onion, yellow bell pepper and red lentils are flavored with garlic and a dash of cayenne pepper and slow cooked until tender. Lemon zest and juice and chopped rosemary are swirled throughout to create one of the easiest soups to ever come out of your kitchen. 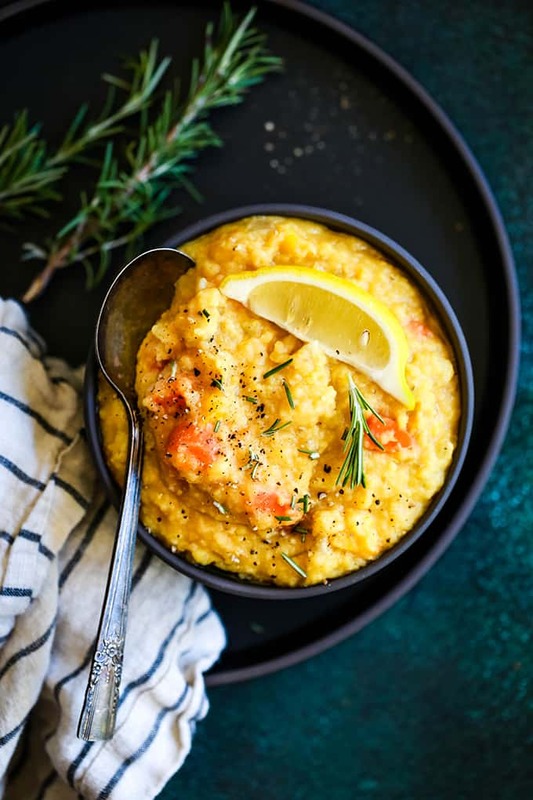 This Slow Cooker Lemon Rosemary Lentil Soup will definitely earn a spot on your menu plan whether it’s Meatless Monday or not. With just 15 minutes of prep time – less if you’ve got mad knife skills! – it’s simply irresistible! 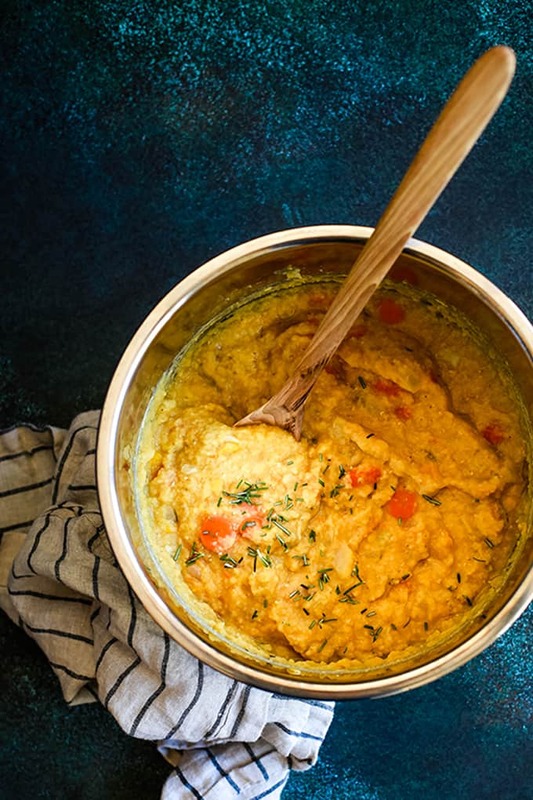 Can You Make Lentil Soup in a Slow Cooker? Absolutely! Using a crockpot or slow cooker to make lentil soup is my favorite way to do it. I’ve even used the slow cooker function on my Instant Pot. No sautéing of vegetables in advance. 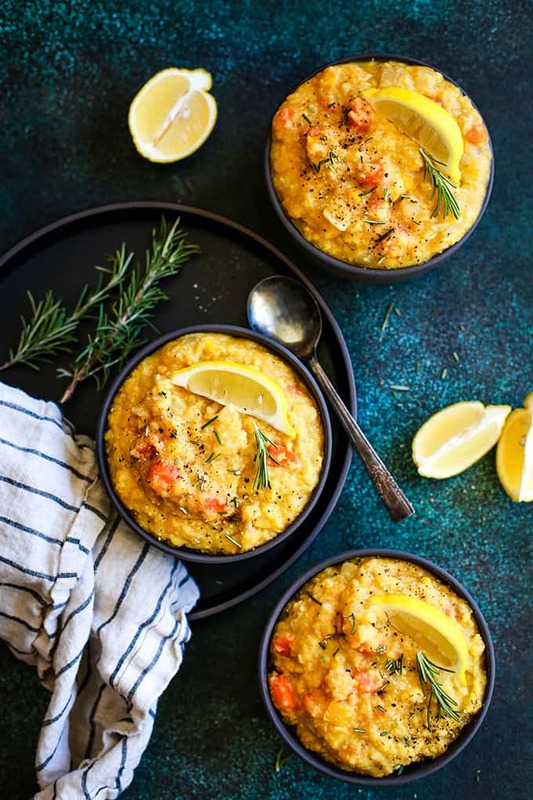 For this Slow Cooker Lemon Rosemary Lentil Soup you simply add all of the ingredients to your slow cooker and let it do the work while you attend to the next item on your to do list. My recipe for Slow Cooker Lemon Rosemary Lentil Soup notes you should cook on LOW temperature for six hours. With that being said, you also can adjust the cooking time according to your personal preference. Cooking for six hours on LOW temperature will make for a more creamy, thick soup texture. If you’d rather the lentils retain their shape and have a bit more bite to them, you’ll want to start checking on then around the five hour cooking time mark. Can You Substitute Green Lentils for Red? You can attempt to substitute green lentils for the red lentils called for in this recipe, though their texture and flavor will differ. 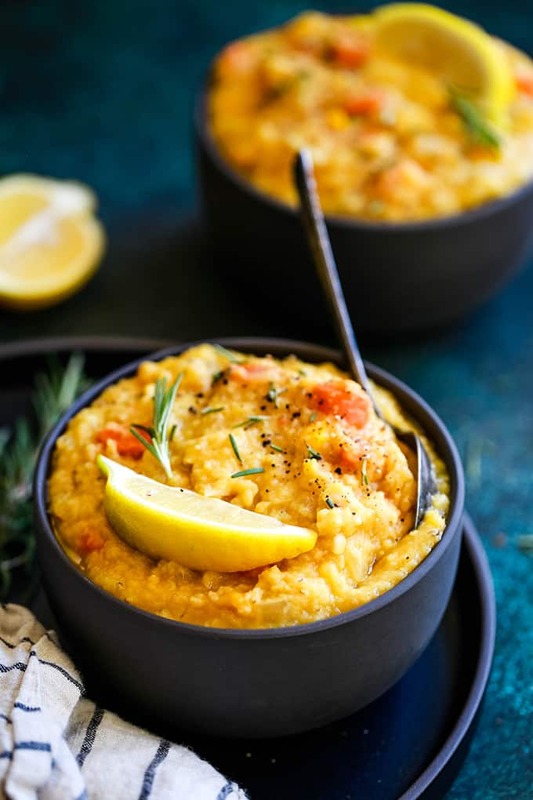 Red lentils tend to fall apart while they are cooking which makes them the best choice for this Slow Cooker Lemon Rosemary Lentil Soup. 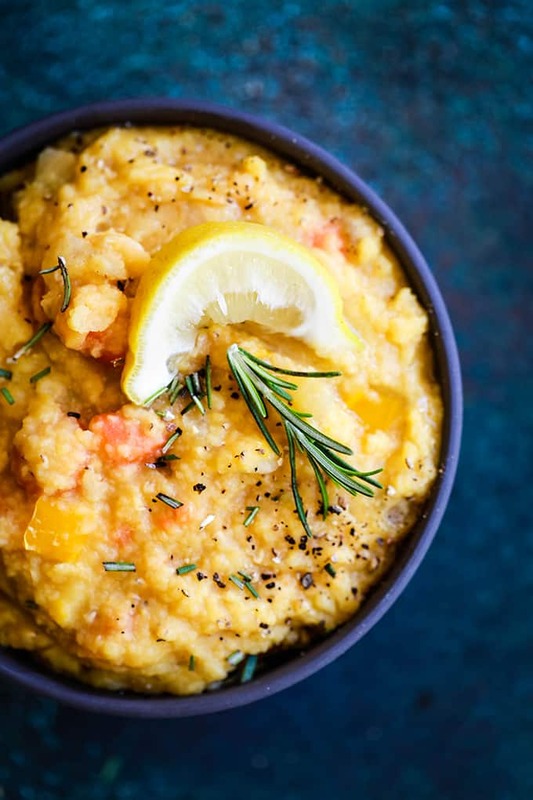 Can You Freeze Slow Cooker Lemon Rosemary Lentil Soup? Yes! In fact, I love to use this recipe for meal prep and freeze individual portions to have on hand for a quick and easy lunch or dinner. Properly stored in an airtight container, it will maintain maximum quality for six months. In a six quart slow cooker, add carrots, onion, garlic and yellow pepper. Add cayenne pepper, lentils, chicken broth, water and salt to slow cooker. Cook on LOW for six hours. Add lemon zest, juice and rosemary. Stir together to combine. Season with additional salt and pepper to taste. 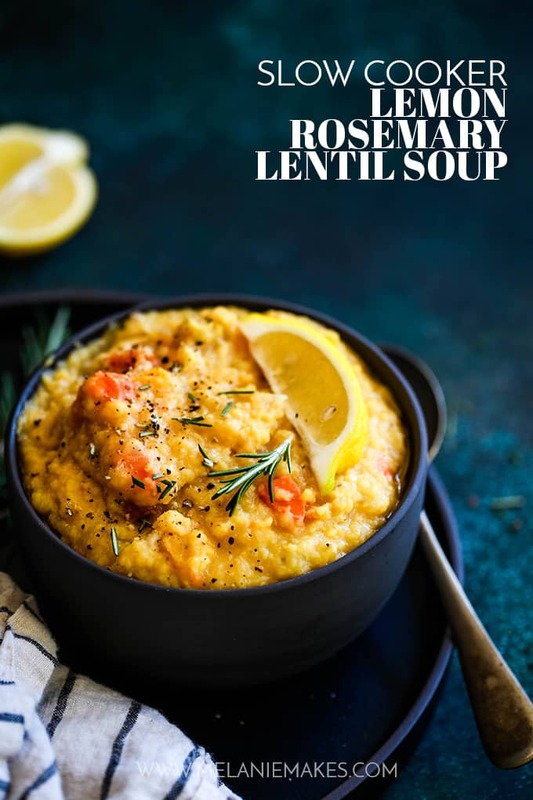 If you’ve tried this Slow Cooker Lemon Rosemary Lentil Soup or any other recipe on Melanie Makes, please let me know your thoughts in the comments below. I love hearing from you and respond to each and every comment! Stir in lemon zest, juice and rosemary. Ladle into bowls and garnish with additional chopped rosemary, if desired. Obviously I’m not the only one that’s fallen in love with lentils. My friends have made them the star of these vegetarian Lentil Meatballs, refreshing Lentil Salad with Feta, Lemon and Parsley and these decadent Cocoa Lentil Cupcakes. Lentils for the win, I say! Tried this tonight, but did it in my IP. Husband made the recipe but didn't share you needed a glass lid and not the IP lid. Soup did not turn out like your picture. Lentils didn't really break down. Does the glass lid make the difference? Not sure if doing an IP cook on it now will ruin or help? Any thoughts? Hey, Sharla - I like the glass lid to ensure that the heat isn't escaping through the vent. It's $11 well spent for me although I'm sure the difference is minimal. Hope you enjoyed the soup! Could I let this cook for 9 hours while I’m at work or would it get too mushy? Hey, Dana - it would be pretty mushy and lacking any texture after cooking that long. I wouldn't recommend it! I should preface this by confessing that I have often thought about creating a food blog detailing all my horribly gone wrong cooking attempts. It would be a lot. I am not a cook. I burn a lot of things and one time I almost set fire to my kitchen on accident. Anyway. I made this soup for Ash Wednesday. Am eating it as we speak. This is so good. It was so easy. This is like a miracle soup. Thank you so much for this recipe. I was a little skeptical at first but I made this recipe for the first time today and I love it. I halved the recipe and made it on my stovetop as I wanted it for an evening meal. It's tasty and also quick and easy. The lemon and rosemary are winning combination. So glad you enjoyed it, Vicki! Thanks so much for taking the time to let me know! Can you stove top cook it too? If yes, do the veggies need to be sauteed? Hi, Liam - I know others have, but I haven't as I tend to make the slow cooker do all the work for me! Looks great! I was wondering why you don't cook the lemon and rosemary in the crockpot with the rest of the ingredients? It make me worried that those flavors won't be truly incorporated. 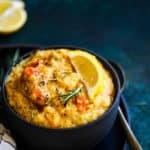 Hi, Angelica - if you incorporate the lemon and rosemary with everything else you'll either end up with no flavor as it's already been cooked out because of the longer slow cooking time, or even worse, a bitter taste. Believe me, the soup is bright and flavorful when cooked according to the recipe instructions! Can you substitute dried rosemary for fresh? Hi, Julie - I haven't tried it but you definitely could in a pinch. Because dried herbs are generally more potent and concentrated than fresh herbs, you'll need less -- typically three times less the amount of fresh herbs. Thanks for the heads up, Dee! I wasn't sure who had shared it so just went over to take a look. So appreciate the comment! No problem! Will give your recipe a go some time soon. I’m afraid it was all just a bit too manic for me, on the Facebook live thing. The guy is just crazy! I agree, Dee - comical but there's no way I could cook from it! Thrilled that you enjoyed it and took the time to let me know, Sylvie. Thank you! This is one of my absolute favs! I have made it countless times! Now that I have an Instant Pot, do you happen to have the conversion for this recipe from slow cooker to Instant Pot?? Hi, Tina - It's on my list of things to test! Stay tuned! So glad you enjoy it! I just made it tonight in the instant pot. Cooked it on pressure cook high for 10 minutes and the lentils retained their shape and the veggies were soft. Hope this helps. So glad it worked for you, Abby! I made this soup for the first time last night and it was a hit, a new family favorite! So delicious, creamy and filling. Great recipe Melanie, I will share this on my Facebook Feed. Thank you! So glad that you enjoyed it, Amy! It's one of my favorites, too! Thanks so much for taking the time to let me know you enjoyed it and for sharing! My soup's been in the crock pot for 3.5 hours now - still looks very liquidy. At what point does it thicken up? Or will I need to use a blender? Hi, Roni - The recipe calls to cook it for 6 hours on LOW so you still have almost half of the cooking time remaining. When that time is over, all you'll need to do is stir it and add the remaining ingredients. Do you have to pre soak the lentils? It sounds delicious. Hi, Linda! No presoaking needed - just pour them in your slow cooker per the recipe instructions! I love this idea! So simple and pretty! This couldn't look any more perfect! Wow this soup looks so amazing! I was just looking for a healthy, easy recipe for dinner. This came just in time. Thanks for sharing! Can't wait to hear what you think, Allison! This is such an ultimate comfort food! I can't wait to try it!! The hit of lemon totally brightens the whole soup! I love how hearty this soup is! I love lentils so much, I am sure I will love this soup! I'm sure you will, Catalina! I love that it is made with Lemon and Rosemary, that combo is perfect together! So comforting! I made this recipe today. I really liked it but found that it was done in 4 hours. Hi, Jamie - so glad you enjoyed it! 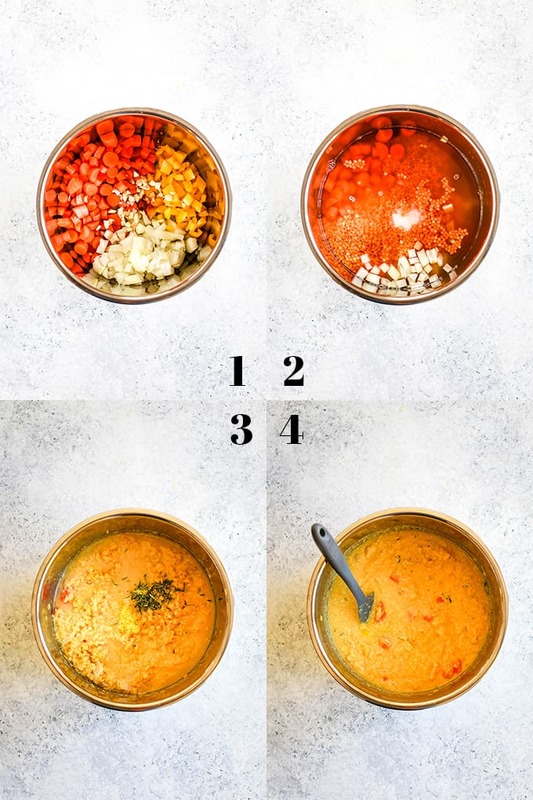 If you like more bite in your lentil soup, you could find it done to your liking earlier. Such a sweet compliment, Sonia - thanks so much for taking the time to let me know that you enjoyed it! Hi - If I cook this in a 3 quart crock pot should I half the recipe and cook it on low for 3 hours? Thanks! Is this ok to freeze? Hi, Kelsey - You definitely can freeze it! The texture might be a bit different afterwards but it won't affect the taste whatsoever. I’ve made this three times now. Delicious and healthy soup! I do add probably a full cup of liquid to get the consistency I like, and squeeze a lemon wedge on top with each serving. Thanks for the recipe! I love the squeeze of lemon on top, too, Jen! Thank you so much for taking the time to let me know you enjoy it. So appreciate it! I made this and thought it was wonderful. I hope it is all right I shared it on my blog for a menu plan. Thank you for the recipe! Can you freeze the leftovers? Hey, Ashley - You definitely can freeze leftovers, just be aware the consistency might change a bit. I love lentil soup and really want to try this version. The lemon and rosemary sound amazing! Thanks so much, Aggie - can't wait to hear what you think!